Without a doubt the number one luxury 3 bedroom home in the Dominical area, built with the finest materials and detail. Providing privacy, relaxation, extensive security and easy access. This home has the most coveted ocean view on the Southern coast, looking North from Dominicalito to Manuel Antonio National Park. Watch the sunset while relaxing on the patio with a 180 degree view of the Pacific Ocean. The finely appointed home features a total of 3 bedrooms including 1 master suite, 4 bathrooms, gourmet kitchen with stainless appliances, dining room, living room, large deck areas, infinity pool, central A/C, granite counter tops, fine furnishings, wireless Internet, satellite TV and a breathtaking northern coastal whitewater view. Dominical offers a variety of dining venues, known for great surfing and laid back atmosphere. There are a variety of activities to enjoy including kayaking, horseback riding, hiking, waterfall tours, white water rafting and zip line canopy tours. Professional services are available for an additional charge. The South Pacific region: Perhaps the true heart of Costa Rica is kept in the South Pacific, home to the country's most stunning natural treasures and the Corcovado National Park, described by the National Geographic as 'one of the most biologically intense places on the planet'. A naturalist paradise and a surfer's dreamland, the South Pacific is preserved by its remoteness, with its secluded beaches, pristine waters and lush Pacific rain forest. This region creates a natural heaven and the ultimate escape or vacation. Feel safe and secure in our home with a 24-hour entry security guard along with a nighttime roaming security guard. A NOTE FROM US TO OUR POTENTIAL RENTERS: Building this home was a dream come true for us. A four-year process, from design to finish, has us beaming with pride. It is truly rewarding to receive all the positive feedback from our rental clients and we are thankful for the respect our clients show to this home by leaving it in a condition that makes it hard to believe someone stayed there. We are also pleased with our staff who prepare the villa with floral greetings and maintain the 5 star accommodation standards. It is not an easy choice to rent a luxury property sight unseen. Each one of our reviews represents just that decision. In fact, every rental client since the inception of our rental program has been totally pleased with their decision to rent with us. We will continue to make this the best rental choice in the area! Outdoor Patios and sundeck: This home features two outdoor patio/deck areas around the infinity pool as well as private patios adjacent to the king and queen bedrooms. The pool area has two chaise lounge chairs in addition to a 60" round patio table with four swivel/rocking chairs. A sun umbrella is placed next to these for your use. The sun deck provides an expansive sunning area as you listen to the cascading water from the infinity pool. This relaxation area has two chaise lounges and a cocktail table...another great place to relax and watch the sunset. The Master suite and the South bedrooms each have a private patio and provide the perfect spot to have some 'alone time'. Guests receive arrival greeting, departure assistance and daily maid service. Our professional concierge service arranges tours, massages, chefs and a ready smile. Shampoo, conditioner, moisturizer and hand soaps are provided. Towels, linens, pool towels, hair dryers, alarm clocks and a vast assortment of kitchen items (utensils, glassware, pots, pans, dishes, bowls, blender, toaster, mini wine cooler, etc.) are available for your use. Flat screen TV, DVD player, satellite TV, assorted DVD's, multi-room stereo system, including speakers at the pool deck, are located in our entertainment center. Each bedroom suite includes a hotel safe for your valuables. Umbrellas are at the front entrance. Luxury home and gardens with unparalleled ocean views, north to Manuel Antonio. Infinity pool and sunning deck. Gourmet kitchen with top of the line appliances and cookware. Central air-conditioning, rarely found in Costa Rican residences. All securely located in the finest gated community on the Central Pacific coast. After owning another area properties for many years, we chose this villa for undoubtably the best views in Costa Rica, the attention to detail in the construction, fabulous infinity pool and spacious kitchen. Master bedroom has double shower with an open view to the outdoors. Complete with dual sink vanity, large tub, bidet/toilet privacy room. All other bathrooms have large shower areas with teak benches and large vanity areas. Shampoo, conditioner, soap and moisturizer are provided. Every item you have at home and more! Formal dining area for family dinners or a special romantic evening. Owner's reference books/guides on Costa Rican plants, animal and birds plus a variety of fiction and nonfiction, current and classics, to be read while in residence. Extensive DVD library kept in home office. 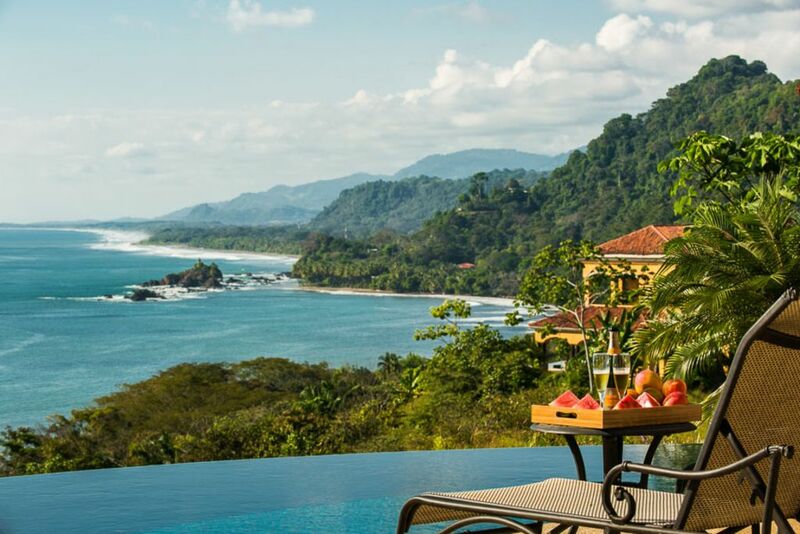 Spectacular infinity pool, overlooking the Pacific coastline, north to Manuel Antonio, 45 kilometers away. Suenos Pacificos was gorgeous, spotless, spacious, and so welcoming Breathtaking view! Our family had the best time at this home in Costa Rica! The home itself, beautifully positioned overlooking the coast, was perfectly outfitted and decorated for a delightful Costa Rican stay. We loved the privacy and each sunset! Dominical was a fun little beach town with great restaurants. We were perfectly positioned for any outdoor adventure- rafting, zip lining, birding, surfing, hiking. But we loved ending up in or around the pristine pool each evening to enjoy the most marvelous sunsets. We can’t wait to come back! Pura Vida! Suenos Pacificos was great! I was pleasantly surprised. The home is well appointed, high end, had well manicured landscaping, was private and very spacious for a 3-bedroom. My wife calls me a vacation snob because I refuse to stay anywhere that is not a five star so this is a huge compliment from me. This house met all my “must haves”. My “must haves” are: 1) each room needs its own bathroom 2) the master bedroom and bathroom must be exceptional 3) the kitchen must have all high-end appliances, 4) it must have AC throughout the house, 5) it must have a pool, 6) it must be very clean 7) the area/community must be safe and within a few miles of shopping, restaurants and a good gym 8) there must be good views of the ocean, 9) there must be a good large TV in the gathering area and lastly 10) no cheap furniture that makes it look like a rental (and all bedrooms must have shades). This place hit it out of the park and at the daily rate was a great value. Note: I have no connection with the owners, the mananagement group or anybody that knows either. This was booked purely through VRBO. Thanks for renting such a great place. We all loved it and had a fantastic time. This was our second visit to Dominical and stay at this beautiful, well appointed villa. Everything was perfect! The kitchen has everything one could need to create a meal. Last visit we used the concierge service to arrange a fishing trip and hire a chef. The chef and his wife cooked our freshly caught Mahi Mahi just perfectly, made us ceveche’ and yummy homemade flan. The beautiful mature landscaping was spectacular from morning until night as was the infinity pool. Sunsets to die for! We will be back. Place was fantastic. We have traveled now for 25 years with our children and although I am getting older, I think this was the best so far. Tocans, oripandolas, dart frog, and the view is to die for. I am moving to Costa Rica and would consider buying property in las Olas. --A tiny coastal town 28 miles south of Quepos, Dominical is a 4 km long beach strip. With its stunning backdrop of lush green forests and palm trees you will find pure relaxation. --To get to Dominical from San Jose, you can fly into Quepos or Palmar Sur local airports and rent an SUV from there or hire a driver from San Jose to take you to the house or rent an SUV in San Jose and drive here straight down the coastal highway from Quepos past the town of Hacienda Baru. With near perfect weather all year long, Dominical has warm temperatures during the day and a cool ocean breeze by night. --Dining is a fabulous experience in Dominical and surrounding areas, especially if you love fresh seafood. Kayak off the coast or enjoy some diving or snorkeling opportunities in the area. Horseback tours can also be arranged to the nearby Nauyaca Waterfalls, or visit the Marino Ballena National Park. Canopy tours, fishing, surfing and more all easily arranged thru our concierge service. Golf: The closest 18 hole professional golf course is 1 hour away. A top notch 9 hole (soon to be 18) course is now open 30 minutes South. Feel safe and secure in our gated neighborhood with a 24 hour entry security guard along with a nightime roaming security guard. Longer term rates are negotiable, short notice rates possible.